How old does my child need to be to take flute lessons? The flute can be difficult for younger children to hold properly. Because of this, we believe a child should be at least 9 years old (in the fourth grade) to start flute lessons. Younger children may be interested in recorder lessons until they are old enough for flute. 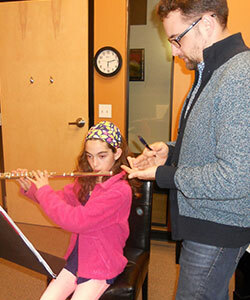 Does a student need any prior musical experience before taking flute lessons? No prior musical experience is needed. Previous musical instruction is helpful, but is certainly not required. Band rehearsal is not practice time. Lessons at Southern Park are designed to allow students to reach their full potential. Regular, daily practice (outside of school) on the assigned material is necessary in order to improve. However, we are happy to work on band music with your son or daughter during the lesson. Where can I purchase or rent a flute? We are fortunate to have one of the country's leading flute specialty shops right here in Charlotte! J.L. Smith & Co. has been connecting flutists with the best instruments for over 20 years. www.jlsmithco.com If you prefer to rent a flute, Music & Arts, with many locations in the area, is a good option for rental instruments.